Take Control of Seasonal Allergies, Naturally! • Check the local allergy forecast online before planning an event outdoors. • Avoid being outside in early morning when pollen production peaks. • Change your clothes and shower after coming in from outdoor activities. • Wear sunglasses to protect your eyes and reduce your exposure to allergens. • Keep windows closed and set the air to re-circulate if you have air conditioning. • Visit us for an adjustment to help your body handle the stress caused by the allergens. Remember, chiropractic care makes it easier for your body to function, as it should. So, keep the sniffling to a minimum and get the most out of this year’s beautiful weather. These rings of fibrous tissue have jelly-like centers that act like “ball bearings.” They separate each vertebra, permit the natural curves of the spine and allow us to turn and bend. Chiropractic care offers a natural, non-surgical resolution for many disc problems. Bulging Disc: A weakened area of the ring allows the centers to bulge and put pressure on nearby nerves. Chiropractic care can often eliminate the need for surgery. 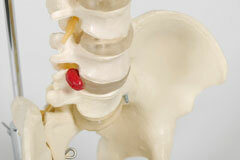 Herniated Disc: The herniated or ruptured disc is more serious and commonly seen in the lower back. The disc’s soft center pushes out through an area weakened by trauma or degeneration. Chiropractic care is worth trying before more drastic measures. Do you know someone facing disc surgery? Be sure to send them our way for a possible all-natural solution, first. Is bad weather, pain or a hard time in life getting you down? While it may seem silly, laughter can help you find your sunny spirit again. Having a good attitude can help lighten your mood and remind you to smile in tough times. How? Research studies have shown that laughter can help increase blood flow, improve your immune system, lower your blood sugar levels, help you relax and feel better overall. So, how do you laugh more? • Don’t let the little things get you down, look for humor in life’s serious moments. • Spend more time with positive, humorous people (or kids) that make you smile. • Visit a comedy club or put on a funny movie. Let it crack you up! So, find joy in the little things in life and let yourself be the healthiest, happiest YOU!